This was good, oh so good! Every Sunday one of our friends comes over and I teach him how to cook because he wants to learn! It is always something new for him, but this week it was something new for me too (the pizza dough!). I really enjoy having a friend in the kitchen, I love teaching and it’s nice to have a ‘sous’ chef (that doesn’t complain like CH does!). Pizza was one of my friend’s favourite meals, so we decided to tackle it from scratch, dough and all. I absolutely love Annie’s Eats, she is an amazing baker and cook and I almost always start my search for recipes with hers. Of course, I came across Annie’s Perfect Pizza Crust and knew that would be the recipe we’d tackle. We got creative with our toppings, making three pizzas (for three people!). We made Annie’s Chicken Ranch, an original Salmon Pesto and our spin on the traditional Canadian. Stay tuned for the other two posts soon! All three were incredible, we all had leftovers for lunch today (or breakfast in my case!) and the dough/pizza toppings have been put on our make again list. Like, as in make again this week! Give one (or all) a shot, I bet picking up the phone to call for pizza won’t happen as often now! Preheat your oven to 500 degrees (and if you have a pizza stone, preheat that as well). It is good to allow your pizza stone to pre-heat in a 500 degree oven for at least an additional 15 minutes. If you have a pizza peel, lay that on the counter. Otherwise, prepare a sheet of parchment paper (either square or cut to shape of your dough). Now, prepare your dough. On top of your parchment paper or your pizza peel, roll out the dough into a round pizza shape. Leave an edge around outside for the crust. Once you’ve achieved the shape you desire, pinch the outside of the crust and then pierce the crust with a fork all the way around (this will prevent large air bubbles from forming in your crust while it bakes!). While your oven is pre-heating, prepare and cook the chicken. I grilled mine using a cast-iron skillet. Simply pre-heat your skillet, add oil of your choice (I used sunflower) and cook the chicken until no longer pink. Once cooked, set aside and let cool. Now, it’s time to assemble! Pour the ranch dressing over the unbaked pizza dough and spread with a spoon. Then, top with the hot sauce and spread again using a spoon. Sprinkle the shredded mozzarella over the ranch and hot sauce mixture. Then, layer the cooked chicken, tomatoes, red pepper and green onions. When layering, try to think of the end product…you want every piece of pizza to have a bit of every topping! 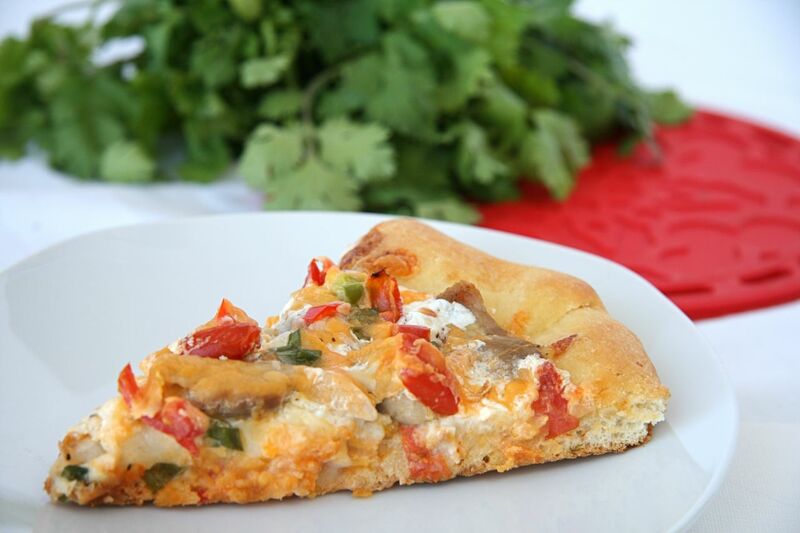 Finally, sprinkle the top of your pizza with the cheddar cheese and cilantro! Carefully move the pizza to your preheated oven/pizza stone. Bake for 12 minutes or done to your liking (I like mine quite crisp and I added a minute of broiling at the end to make my cheese a little crispier!). Let cool for 5 minutes. Then, slice and devour. Mine didn’t make it to the table!